A friend of mine introduced me to Quinoa about a year ago. She put some in a salad she prepared for our lunch. The salad was delicious and I will certainly have to post the recipe at a later date. I had no clue what Quinoa was so of course I had to Google it! Quinoa is a seed, not a grain. It is related to the spinach family. Quinoa is a good source of protein, fat, and vitamin E. It can also be a substitute for any grain. It is a freezing cold dreary day, and I am stuck in doors nursing my sweet little daughter back to good health. I decided to get creative, pull out the box of Quinoa in my pantry, and whip something up. Prepare Quinoa, follow instructions on the box. You will add 1 cup of quinoa and 2 cups of water to boil on the stove top. Once you receive a boil, lower your heat and simmer for 15 minuets. This will make ALOT!! Just warning you! Once your quinoa is finished place about 3/4-1 cup in a bow. Layer with banana slices, almonds, and top with Cinnamon to taste! 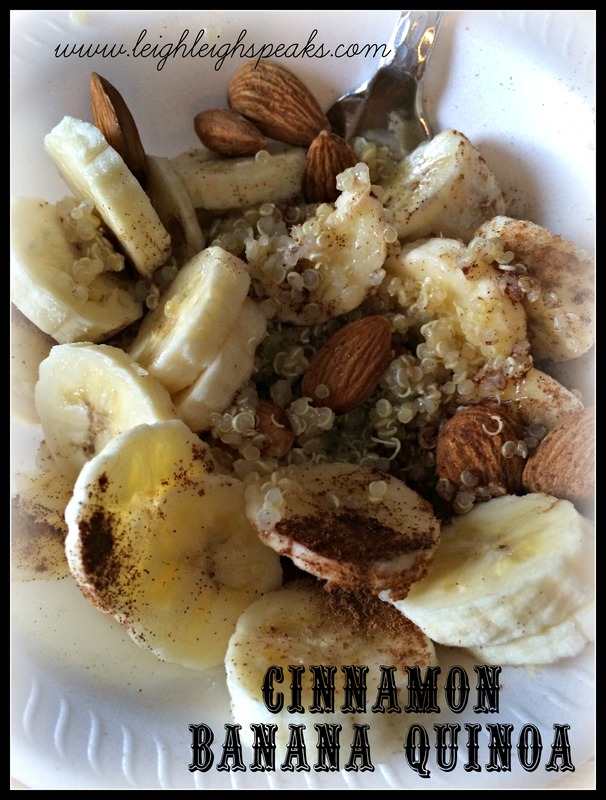 The Quinoa is nice and warm so it led me to thinking that this dish may be best served for breakfast! The texture of the dish reminded me of oatmeal, or porridge! It was very tasteful and very satisfying. The almonds gave it just the right CRUNCH! If you want to make it into a porridge I would suggest you smash the bananas up with the Quinoa and cinnamon first, then add the almonds! What is your favorite Quinoa dish? For more recipes click on my recipe index here! Don’t forget to follow my blog via email subscription!